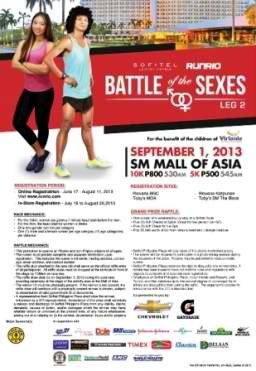 PASAY CITY, Philippines — Sofitel Philippine Plaza announces the launch of the Sofitel-Run Rio Battle of the Sexes Leg 2, a 5 k and 10k Fun Run to be held on the 1st of September 2013 at the SM MOA Grounds, SM Mall of Asia. Luxury prizes from Sofitel is at stake during the fun run including a three night stay at the Sofitel suite, access to Club Millésime, the hotel’s exclusive Club lounge, dining at Spiral, beauty treatments from Le Spa and Vietura, the new Aesthetic Lifestyle Institute. The second run follows the success of its first leg which attracted more than 3,000 runners last March 2013. Sofitel Manila, in partnership with Run Rio, proudly present the second leg of the successful charity fun run, Battle of the Sexes, for the benefit of the Virlanie Foundation! Sofitel – Run Rio Battle of the Sexes is presented to you by Gatorade in cooperation with Gold’s Gym, World Balance, Rexona, Sky Cable, Prime Power Manpower Services, Eupac, Dole Philippines, Darlington Socks, Johnson and Johnson, Health Express, Delsan Office Systems, Star Xpo Enterprise, Classica Litho Corporation, Nizoral, Primier Water and Timex. 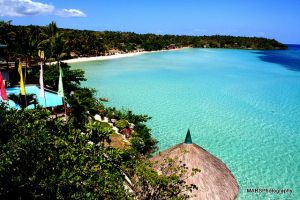 Media partners include Philippine Star, Business World, Manila Bulletin, WhenInManila.com and ABS-CBN News Channel. For more information on the Run Rio Fun Run, visit www.runrio.com or contact and email 0929 7178164 and runrio.racereg@gmail.com. Sofitel Legend and & Sofitel So are two labels that come to enrich Sofitel Luxury hotels. Sofitel Legend hotels are iconic and mythical; they are often centuries-old listed heritage buildings: Sofitel Legend Metropole Hanoi, Sofitel Legend The Grand Amsterdam and Sofitel Legend Old Cataract Aswan. Sofitel So hotels are new « boutique hotels » characterised by a stylish focus on contemporary design by famous architects and/or embellished by international celebrities from the world of fashion, design or art: Sofitel So Mauritius Bel Ombre, Sofitel So Bangkok and Sofitel So Singapore (2013). 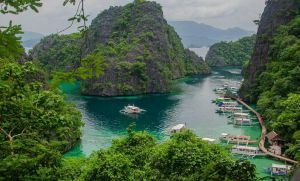 How to Spend a Weekend Getaway in Subic, Philippines?